I am a stasher. I dont mention this publicly often, but I have about 16 cubic feet of fabric stashed away in my sewing room. I like having my stash – often when inspiration strike, I dont want to spend a few days hunting for the fabric or wait for my shipment to arrive. My ikea bookcase is pretty much overfilling with fabric, and one of them is filled with scrape fabric left over from other projects. I dont like throwing scrapes away in case the garment needs repair – I can get a matching fabric (though this has literally never happened, but hey! just in case). I also never throw away old bedsheet or curtains – they make great muslin or even garment sometimes. But I need some room in my shelf for all the nice fabric I have. 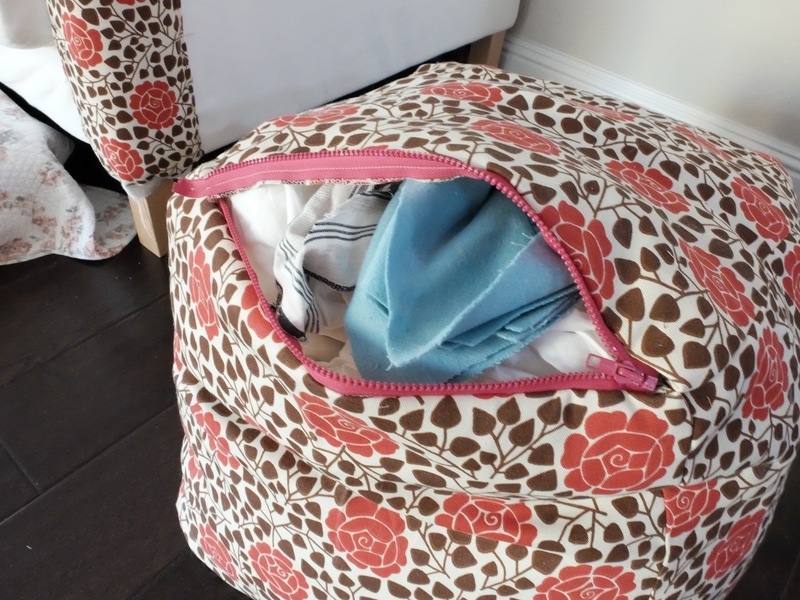 Ive been having this idea of making a square stool/bag thing with a zipper so I can store all the scrape fabric inside, but it will also be a functional furniture in my living room. I finally got around to make it. I love it! 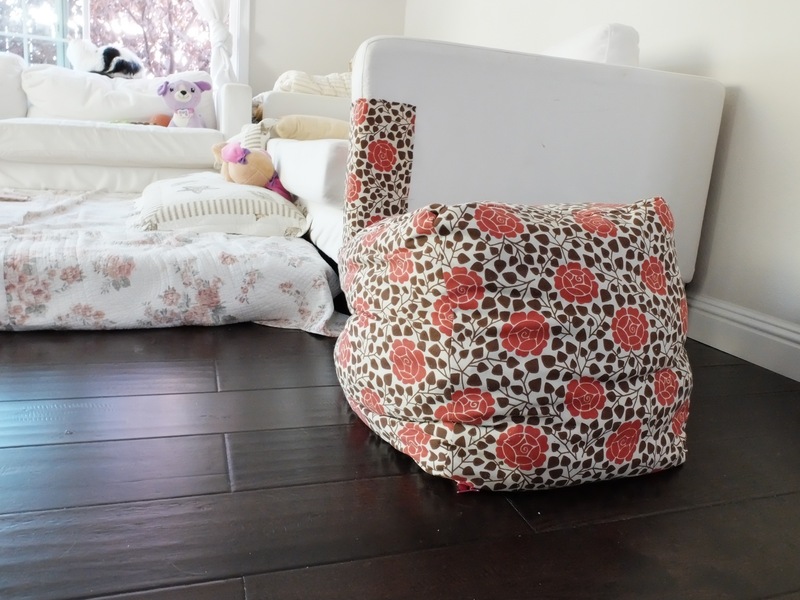 There are some more room in there for more fabric, but as is, its quite nice and comfy as a stool/bean bag. Side note – I finally got around to patching up our very ripped up couch. Like most sewist out there – I have a cat. She destroys all couch corners and I gave up on having an un-ripped couch in the long run. All my couch will start having fun patches! Now I have more room for my stash!! This entry was posted on Saturday, October 24th, 2015 at 12:00 pm	and posted in finished pieces. You can follow any responses to this entry through the RSS 2.0 feed. Such a great idea! 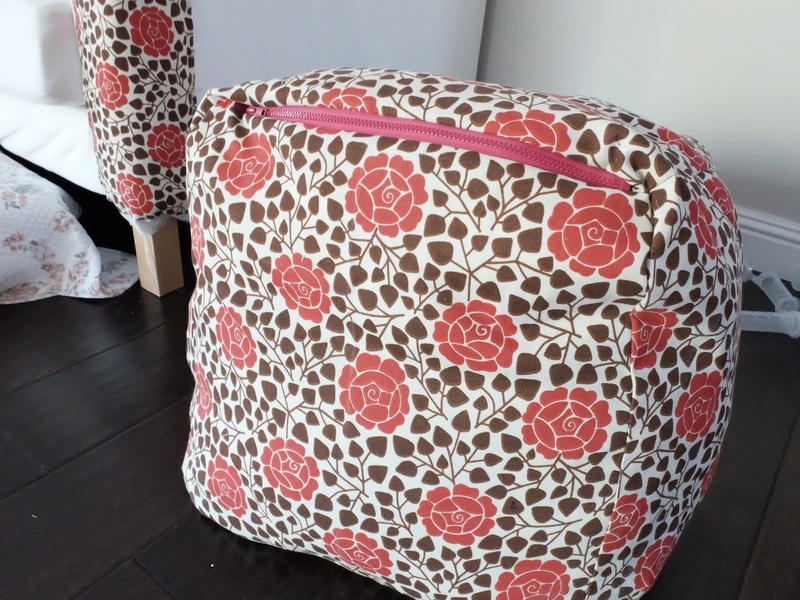 I’m always short on shelf space but I also need a stool for the armchair in my sewing room, so making one that I can store my ugly old muslin-bedsheets in, would be awesome. That way my pretty fabrics can really shine on the shelves 🙂 Thanks for the inspiration! Oh, and I love the patched couch, too. Such a nice touch of personality. thank you! i am glad to give this idea 🙂 hope to see it on your blog when you get to it!!! I’ve made a very similar item! I do find it’s great storage, but I never think to go in there to find anything. I also threw my old muslins in there, and accidentally stabbed myself on a pin when I was rooting around in it!! Hope yours is a little less hazardous than mine! omg – that is my #1 fear with this design!!! lets hope mine is mostly cleared of pins!